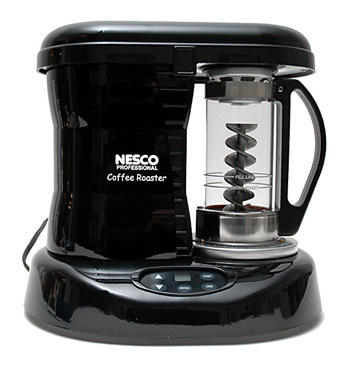 Sorry but we are sold out of Nesco Professional Home Coffee Roasters. We should have more available soon. Please add your name to our waitlist and we will let you know when more arrive. Nesco Professional Gourmet Home Coffee Roaster is easy to use and produces the least smoke of any home roaster we've seen. Formerly called Zach & Dani's, this roaster, is in fact, the only one on the market with a patented catalytic converter smoke elimination system. Beans are kept moving by a clever auger screw system in the roasting chamber. Hot air is drawn up the roasting chamber, across the top and back down in a counter clockwise direction, leaving chaff in a collector located at the top of the glass chamber. Roasting times are about 25 minutes which includes a 5 minute cooling period. This combination of roasting and cooling times is both a strength and weakness for Nesco Professional roaster. We really like the way it produces lighter roasts - up to Full City levels. The roasts are evenly colored and surprisingly delicate; we find them particularly aromatic and it's clear this roaster's design is easy on bean cell structure. The cooling fan is a bit underpowered. Producing dark roasts is a weakness as the cooling system is not able to stop the roasting process quickly enough and the resulting coffee can be baked and tipped. If your tastes run toward dark roasts we would recommend other roasters with higher roasting speed and more powerful cooling. 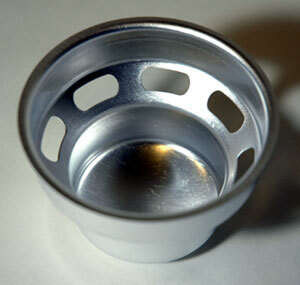 But, if you primarily roast to levels up to Full City you will find this a reliable, repeatable roaster. The maximum roast length is 30 minutes but up to 5 more minutes can be added during the cycle. Almost smoke free. Built in catalytic converter. RECALL - recovers the previously entered roasting time. START - As you would expect, pressing this starts the roasting process. COOL - Roasting can be stopped at any time by pressing this button. UP/DOWN arrows increase or decrease the roasting and cooling times. LCD counts down remaining time in whole minutes. LEDs next to 'start' and 'cool' indicate if those modes are active. The chaff collector (left). A screen sits atop it during roasting, which allows airflow while keeping chaff in. 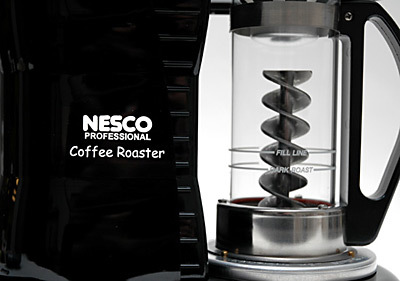 How does the Nesco Professional Home Coffee Roaster work? The keypad and controls are as simple as can be. Set the overall time of the roast using the 'up' and 'down' arrows; the time includes a 5 minute cooling period. Press 'start'. 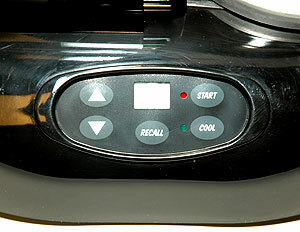 The programmed roasting time is displayed in the central LCD, and counts down. If you want to stop the roast before the alloted time press the 'cool' button. Likewise, if you want to add to the roast press the up arrow while roasting - you can add up to five minutes. Press the 'recall' button for subsequent roasts to use the same time. 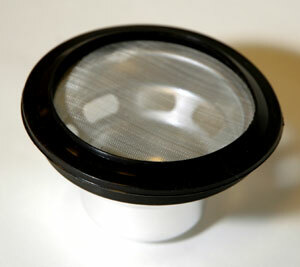 This roaster does not allow for "profiles" or programs but does a good job with lighter roasts. 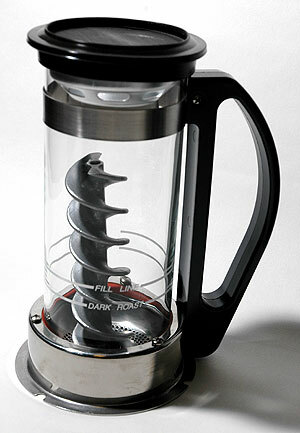 Glass roasting chamber showing auger, base and handle. Fill line is also shown. The lower fill line is for dark roasts which expand more during roasting. The roasting chamber in place. The airflow is in a counter clockwise direction and fully recirculates. As the exhaust passes through the catalytic converter smoke is removed. 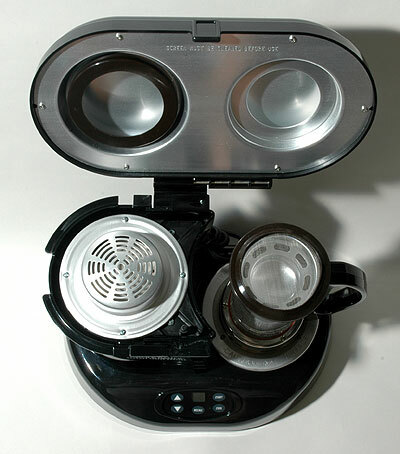 Top-down view of the roaster with cover raised. Chaff collector and screen are in place over the roasting chamber (right). Note: This product was formerly sold under the brand name Zach & Dani and was always manufactured by Nesco. The Zach & Dani name was recently retired and it is now called Nesco Professional. The product is identical except for the name plate. User manual can be downloaded here in Adobe Acrobat (pdf) format. It is 10 MB.